It appeared for sale on a Dutch auction site. The seller readily accepted my offer and today it arrived. 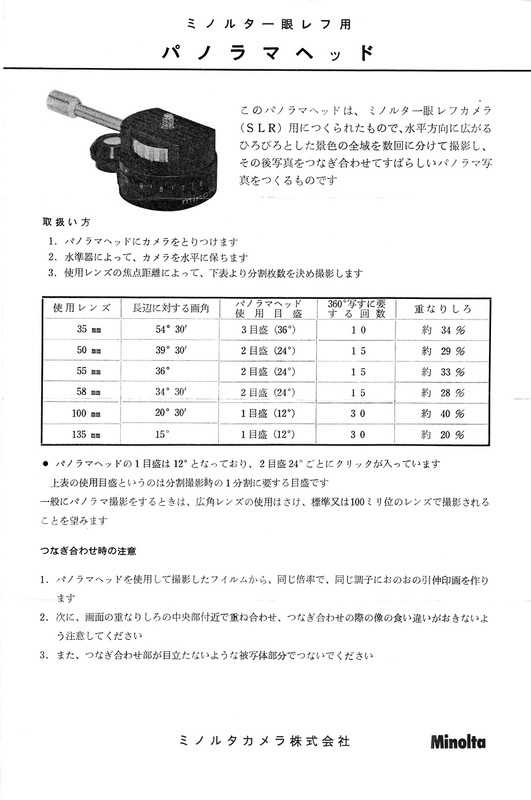 No box, but fortunately the manual was included, one A5-ish sheet with English on one side and Japanese on the other. 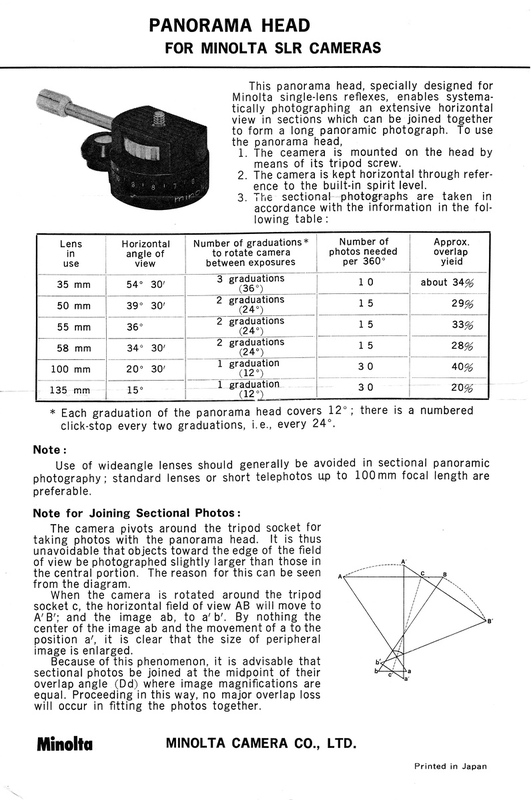 Operation of the panorama head appears to be quite simple in practice. I followed the manual’s advice to avoid anything shorter than 50mm and used the Sony A7R2 with the Zeiss Loxia 2/50. 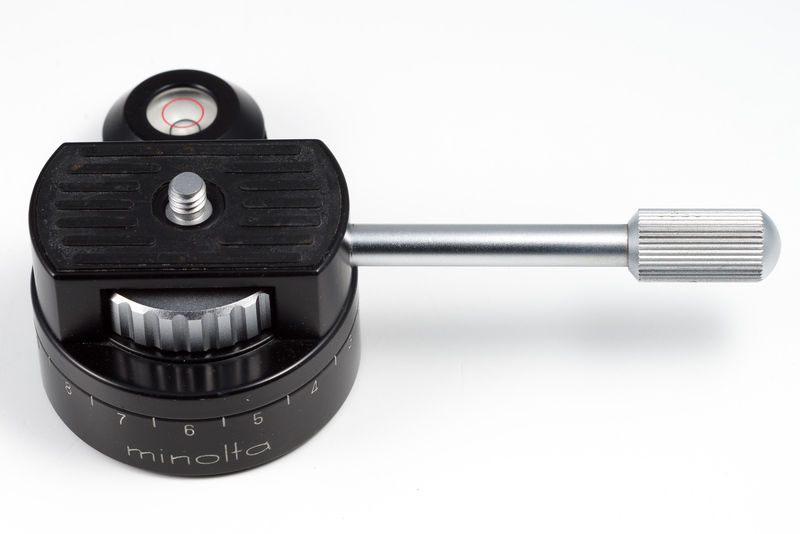 I have standardized on Arca-Swiss heads and mounts and the Minolta head features the standard 1/4″ thread, so I had to use a mounting plate for the panohead and the camera was used by itself, i.e. without the usual L-plate. That’s a pity because in this setup it’s not possible to mount the camera vertically. The spirit level in the panorama head is leveled by adjusting the tripod’s ball head and then it’s just a matter of making a picture and move the panohead to the next click stop, 15 times in total. Off to Lightroom with the 15 pictures. No dice, Lightroom refused to merge the files into any sort of panorama. I had better luck in Photoshop, the resulting file is almost 6 GB! Here’s the 360º pano of my backyard. And there’s my problem with pano’s: the excessive width/height ratio makes it almost impossible to show it appropriately on a monitor, you’d have to print it really big to see what’s going on. It is visible here that the pano head didn’t do a proper job of leveling the camera, the scene’s verticals are skewed. I noticed in use that there is some play in the head and I think that’s by construction, the pano head doesn’t look overly worn to me. If I really wanted to do panorama’s, I’d go for a Really Right Stuff panorama head that is Arca-Swiss compatible and will probably perform better too. 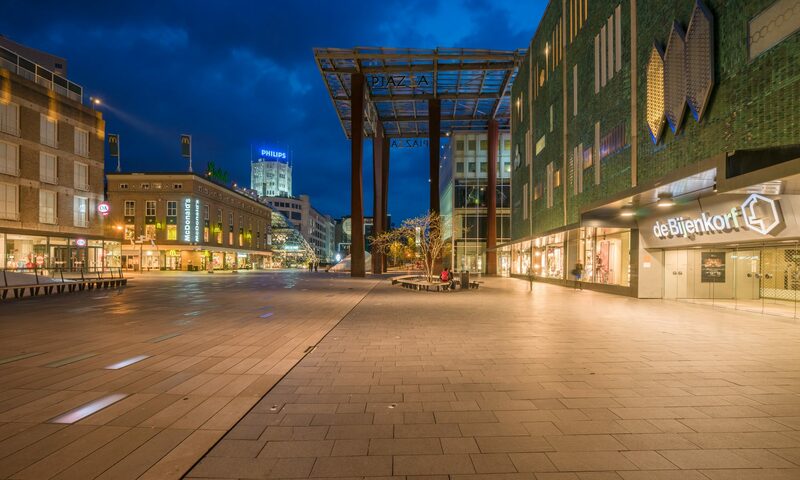 Costly business, not interested enough in panorama pictures to spend that kind of money.